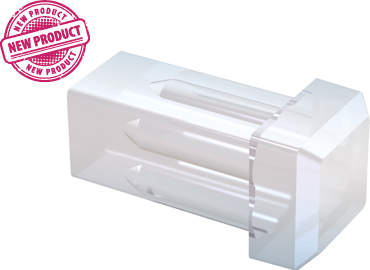 This new square-headed design of front panel light guide is a logical development of MENTOR’s popular 1282 range. The square radiating surface with its bevelled edges creates an individual lighting effect and offers new creative design possibilities. These square light guides are highly versatile due to their variable Length A dimension being customisable from 5mm to 45mm. Versions using a special diffusing material to produce a frosted effect are available, as is self-colouring of the light guides. The latter allows the potential illuminated colour to be shown even when the LED is in an "off" status. Installation is achieved with a simple push-fit into the front panel. The recommended opening of the housing is □2.8 -0.05mm. ESD resistance is <10kV at a Length A of 5mm, increasing by about 1kV for every millimetre of length.